AWIN Video, Text, Mobile, Rich Media, Banner advertising network details. 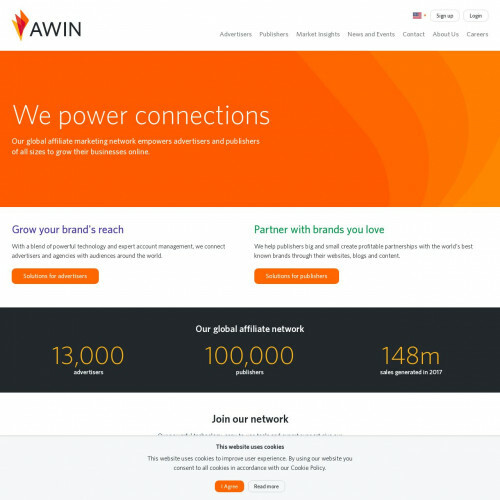 Awin is a global affiliate network which connects advertisers with audiences across the globe. With 8 years of development, the network has opened 15 offices with one thousand employees all over the world. At Awin, technology is leveraged to provide partners with a comprehensive and powerful platform that helps them optimize their campaign. If you encounter obstacles? No worries, Awin has a support team consisting of top-notch experts in the field will assist you actively. 13,000 advertisers and 100,000 publishers have trusted Awin to be their long-time partner who successfully helped them generate 148m sales in 2017. Now it's your turn to add up to the magnificent achievement with Awin! You can check Awin reviews on Affbank and ask Awin Team any question by using the contacts above, especially about how to earn money!